robin hood: Robin Hood (1912) and other silent Robin Hood movies. Robin Hood (1912) and other silent Robin Hood movies. Douglas Fairbanks' "Robin Hood" (1922) was not the first movie about the famous outlaw. 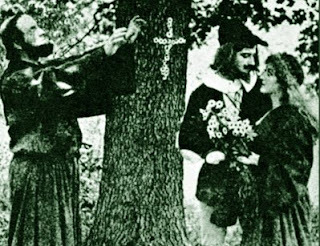 Long since established as a tried and tested success in theatres, the story of Robin Hood was an obvious choice for emerging early 20th century film makers. (See list below). One such film which has survived is American Éclair’s “Robin Hood” (1912). An American branch of the French film manufacturing company, Éclair Studios specialised in short films, state of the art in their day, but soon to be overshadowed by the emerging Hollywood industry. (Not to mention a fire in 1914 which destroyed both studios and negatives alike). “Robin Hood” was directed by Étienne Arnaud and Herbert Blaché. Robert Frazer took the lead role, with Barbara Tennant as his Maid Marian. (Robert Frazer would survive the change from “silents” to “talkies”, appearing in such films as “White Zombie” and “The Vampire Bat”.) Shot in New York, and written by Eustace Hale Ball, the plot involves Guy of Gisbourne and Robin vying for Maid Marian's favour. No surprises there. But what today appears most dated and “odd” to a modern audience is the way the virtues of each character are conveyed to the audience via the momentary superimposition of an animal head. Good guys get good animals, bad guys, bad. For cast list see comments box. 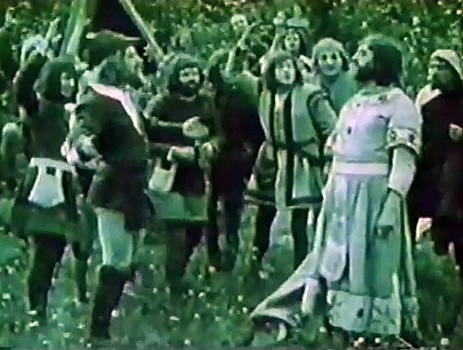 Above: Robin Hood and his Merry Men are startled to find the disguised stranger in their midst turns out to be King Richard. Below: Friar Tuck performs the marriage ceremony for Robin Hood and Maid Marian. 1. "Robin Hood and his Merry Men" (1908). Dir. Percy Stow. Robin saves a man from the Sheriff of Nottingham's gallows. 2. "Robin Hood" (1912). SEE ABOVE ARTICLE. 3. "Robin Hood Outlawed" (1912). Dir. Charles Raymond. Robin is an outlawed Earl who forms an outlaw band and saves a girl from a knight. A Brian Plant as Robin Hood, Ivy Martinek as Marian. Made in the same year, but different from the above article. 4. "In the Days of Robin Hood" (1913). Dir. F. Martin Thornton. Robin disguises himself as a monk in order to enter the castle and rescue one of his men. Harry Agar Lyons as Robin Hood. Lyons would achieve greater fame as Fu Manchu. This movie is interesting because it was filmed using Nottingham locations, and in Natural Colour Kinematography. 5. "Ivanhoe" (1913). Dir. Herbert Brenon. Robin helps Ivanhoe rescue Rebecca of York from the clutches of Sir Brian de Bois Guilbert. Walter Thomas as Robin Hood. NOTE: Two different films of this title were made in this year. One American, the other British. This is the American version. 7. "Robin Hood" (1922). Douglas Fairbanks as Robin Hood. See THIS LINK for pics and review. 8. Robin Hood Jr. (1923). Dir. Clarence Bricker. Frankie Lee as the young Robin Hood. For more Robin Hood silent movie pictures see THIS LINK. See Comments Box for cast listings of Robin Hood silent movies.